Although we are a Charlie’s Soap loving household; they are hard to come by. We usually have to order it online. So when we run out and need a laundry detergent; we turn to Ecover’s Ecological Delicate Wash Laundry Wash. It’s gentle on the planet but tough on cleaning. We even wash our cloth diapers in Ecover (with Bac-Out by Biokleen). LIke Seventh Generation, Ecover is a well known Environmentally friendly company that stands on its brand reputation. What we love about Ecover is that its relatively affordable for a family on a budget (like us) and its wide availability. It used to be available in the Natural and Organic section at our local grocer. Since our move to South Florida; we do have to trek to Whole Foods, but it’s worth it. We like to browse the bulk aisle while we are there. It’s good on fragile materials like silk and wool. Great to wash wool covers with. Should I mention how good it smells. Very fresh but not overpowering. I really dig it. 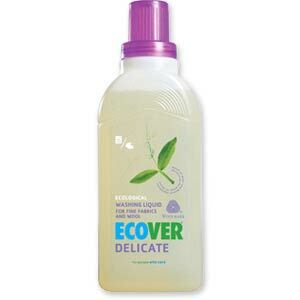 Ecover delicate wash is suitable for both top and front loading machines. I bought a huge tub of Charlies Soap (1-year supply) and they shipped it to me free. It’s great. However, I did have to stop using it on my cloth diapers. After months and months of using it, stripping my diapers, adding water softener, extra rinses and everything I could think of, my daughter still kept getting rashes (we have very hard water and lots of hemp diapers and I read that Charlie’s Soap doesn’t always do well in hard water). So, I switched to Ecover Laundry Liquid and LOVE it (rash is gone). I did see the delicate version at the store. Maybe I’ll try that next. However, on their website, in one of their liquid laundry products, I did see SLS as an ingredient. Do you know if they are phasing this out (I’m not sure if it’s in my version. I live in Europe and I can’t tell if I’m using a different version or not – though, I think not)? I was disappointed to see it. Any thoughts? Oh, and I still use Charlie’s Soap on all my other clothes w/no problems.